An epic story of survival in the wilderness, The Revenant is a stunningly beautiful western exploring the limits of human endurance against a backdrop of frontier barbarism. It's 1823, and a scrappy team of fur trappers deep in the barely explored territories of the northern Louisiana Purchase is attacked and mostly slaughtered by natives. 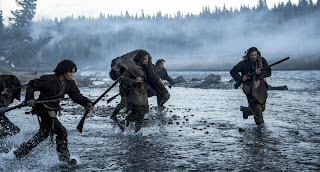 A small group of trappers escapes the massacre, including experienced hunter Hugh Glass (Leonardo DiCaprio), his half-native son Hawk (Forrest Goodluck), the greedy and selfish John Fitzgerald (Tom Hardy), young trapper Jim Bridger (Will Poulter), and Andrew Henry (Domhnall Gleeson), the leader of the party. Glass is inspired by visions and memories of his deceased wife (Grace Dove), and starts to guide the party overland towards Fort Kiowa. But Fitzgerald, who is living with the scars of being partially scalped by natives, challenges his leadership at every step. Meanwhile, a native chief and his men are searching in the same area for Powaqa, a native woman kidnapped by a party of French explorers. While out scouting ahead of his group, Glass is attacked and badly mauled by a grizzly bear and scarcely hangs on to life. Henry leaves him in the care of Fitzgerald, Hawk and Bridger, who promise to give him a decent burial once he expires. But Fitzgerald had ideas of his own, and Glass is abandoned in the wilderness, badly hurt but very much alive. He embarks on a long journey back to a semblance of civilization, his determination to stay alive despite the harsh elements fuelled by a burning desire to seek revenge. The Revenant is a grim, ferocious western, a story of individual survival in an untamed land. Directed by Alejandro González Iñárritu and running for a surprisingly swift 156 minutes with relatively little dialogue, the film is a feast for the eyes and a challenge for the mind, offering a raw beauty but also unrelenting and almost physically exhausting to watch. For the men carving a path in uncharted territories, every step is a struggle, and every encounter with man, beast or nature a potentially existential battle. Loosely inspired by the real adventures of fur trapper Hugh Glass, the story is a deglamourized view of how the west was explored. Men expire suddenly and sometimes in large numbers, and the deaths are often gruesome, bodies left behind with no semblance of dignity. Encounters with natives are mostly wordless. Sometimes a common humanity is found; more often killing comes first, followed by a startling absence of emotion. And nature still dominates, whether through a blanket of uncompromising winter eager to consume men's feeble attempts to exploit the land, or with wild animals stomping their turf and blithely dismissing human competition. 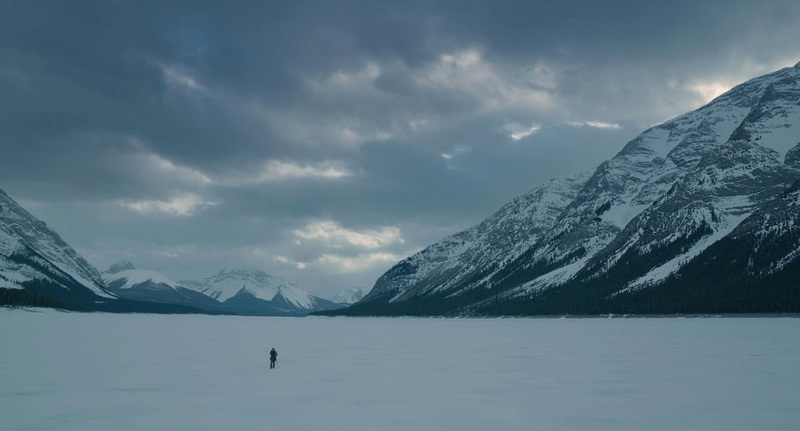 Filmed in British Columbia and Alberta, The Revenant is visually stunning. Iñárritu and cinematographer Emmanuel Lubezki capture imposing vistas of winter in the wild, for the most part ignoring CGI and embracing the harsh reality of the frontier. The actors and crew famously battled deep-freeze temperatures and filming was limited to one hour at dusk, infusing the film with sunset hues and a genuine sense of end-of-the-day cold exhaustion. Lubezki's cameras are just as impressive in close-up shots, with plenty of point-of-view perspectives and fluid movements circling the characters as they confront the unforgiving landscape. 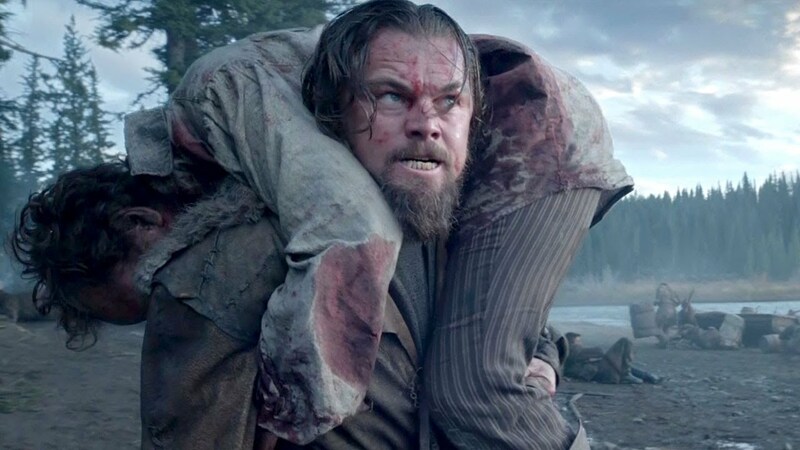 Leonardo DiCaprio dominates the film with a dedicated performance filled with passion and intensity. 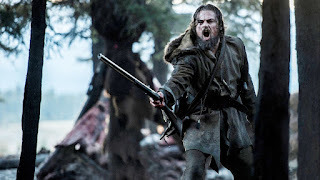 His version of Hugh Glass is a man of few words but plenty of resources and an unrivalled devotion to survival. The rest of the cast members are often difficult to differentiate, buried beneath layers of grey rags, bushy beards and thick accents. The Revenant's main theme is life and death walking close together. For the trappers, explorers and natives, nature offers life and demands death in return. Glass' encounter with the bear pushes him into the clutches of annihilation, but the film treats existence as a binary condition, either alive or not, and with Glass life persists. Enraged by a sense of injustice and equipped with exceptional survivalist skills, he will have another, almost metaphorical encounter with an animal, this time simulating a full rebirth. Glass works his way back to an approximation of functional health and achieves dominion over life and death, this time with the power to decide whether man or nature get the final say. The fragile journey of a father and husband from near extinction to mastery over man's fate is the story of humanity, where savagery and compassion compete for the evolutionary space within.